With the new vote system awarding points based on how the community as a whole is doing, it is in everybody's interest to do their best to get their votes counted, and encourage other people to do the same. This guide should walk you through the process of voting, and if you follow it through then your vote should count towards the weekly total used to calculate vote points. Internet explorer 6, 7, and 8, plus IE9 and higher in compatibility mode, are unlikely to work. Please upgrade to IE9, Firefox, Chrome, or Opera, or switch compatibility mode off if using IE9+ already. You should already be familiar with this process, but just in case. If you are already logged in then proceed to Step 2. Enter your account username and password, press Login. If you have an authenticator attached to your account, you will be asked for a code, provide one from your authenticator, and press Login. If you have entered incorrect details you will get the error message 'Invalid Credentials', try again, and if you still cannot log in there is a link to recover your password on the right hand side of the page. (Password recovery is outside the scope of this guide and will not be covered here). If you have logged in correctly you should see your Username on a drop-down menu in the top right of the page. The 'Account' block while not logged in. The 'Account' block while logged in. Once you have logged in, click the 'Vote' link at the very top of the page, or select 'Vote' from either the left or right drop-down menus. You should arrive at a page entitled 'Vote for NE' with several square pictures at the bottom. Each of these pictures is a Vote Site. 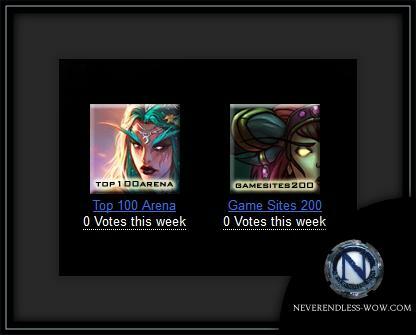 Underneath each picture is the site name, the number of times you have voted for that site since the last time Vote Points were awarded, and possibly a 'Cooldown Timer'. If the Vote Site is showing a cooldown timer then your account has voted for that site recently, and your votes are unlikely to count at this time. If you wish, you may attempt to vote for the site again, and if the Vote Site decides to count your vote then this will increase the weekly number of votes, which is used to determine how many points are awarded. In the browser window that has opened, you should see the picture for the vote site you selected on the left, a white picture containing two words in the middle, and some buttons on the right. The white picture is called a CAPTCHA and is used to ensure that a human is using the site, not an automated computer program of some kind. In order to proceed you must type the words in the CAPTCHA into the text box just below it. If for some reason the CAPTCHA contains something that you cannot type, or cannot read, press the 'Refresh' button to the right of the picture, and a new CAPTCHA with different content will be displayed. You may also listen to an audio CAPTCHA if you are visually impaired, press the 'Audio' button which is the top button to the right of the CAPTCHA. Once you have typed the words in the picture, press the 'Do It' button. If you entered the words incorrectly you will be given an error message and a chance to try again. If you entered the words correctly then you will be taken to the Vote Site, and you may proceed to Step 4. The vote sites each have their own CAPTCHAs for the same reason as we do - to prevent automated programs from voting. This CAPTCHA should be similar to the one in Step 3, so you should be able to handle it without too much difficulty. Depending on the type of CAPTCHA service the vote sites use you may be asked to type a series of letters and numbers from an image or answer a simple question. Follow the instructions provided. Not all of the vote sites will tell you if you get the CAPTCHA wrong! Before submitting the Vote Site's CAPTCHA double check if it is correct. If you have any doubt then request a fresh image using the 'Refresh' Button if available. Enter the words from the CAPTCHA image (or follow the provided instructions if the CAPTCHA differs from the one in Step 3), and click the submit button. Neverendless does not maintain the vote sites. As such we cannot help if a vote site is down or unavailable for whatever reason. If this happens when you try to vote then you will simply need to try again at a later time. You should be taken to the Vote Site's 'World of Wacraft' server list. 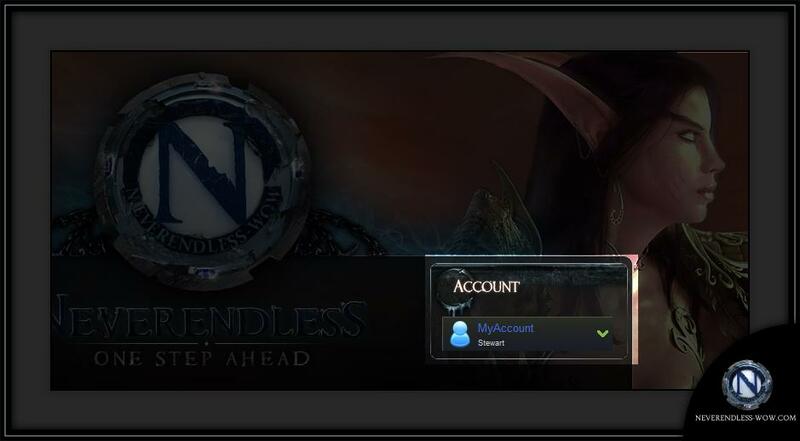 After completing Step 4 and being taken to the Vote Site's 'World of Warcraft server list you will need to click on the Neverendless-WoW banner. 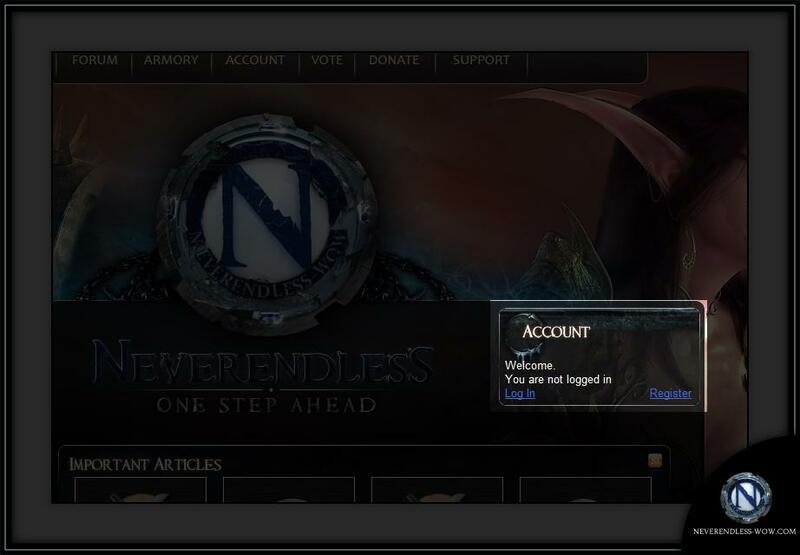 Once you click the banner you will be redirected to the 'Vote for NE' page or the Neverendless main page. At this point, the vote is complete. If you have completed the vote process and your vote was not counted then either you have recently voted on another account or someone using your IP address has already voted. If this happens you will need to try again at a later time. The steps above have walked you through correctly voting for Neverendless on one Vote Site. You can now return to Step 2 and repeat the process for the other vote sites. Once you have voted for all the available sites, congratulations! You have helped the server, and in a few days you should get some Vote Points to spend on your choice of items from the Vote Shop. For even more points, come back and vote again after the cooldowns on the vote sites have expired. 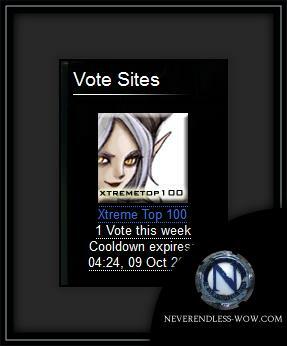 The page listing the available vote sites will show you what time your cooldown will expire for each site. If this time is underlined then what is displayed is the time where you are. If you hover your mouse over the clock, you should see the 'Server Time' for when your cooldown will expire. If however the time is NOT underlined, then that time is relative to the Server's Timezone. The current time in the Server's Timezone is displayed at the bottom of every page on the main website.